Brexit Secretary Dominic Raab has set out what he called "practical and proportionate" advice in case the UK leaves the EU without a deal. Ministers say a deal is the most likely outcome but that "short-term disruption" is possible without one. BBC political correspondent Chris Mason described the publication as a "vast swirling porridge of detail - much of it at a technical level, advising individual industries about the manner in which they are regulated in the event of a no-deal Brexit". Labour said a no-deal outcome would be "catastrophic" and a "complete failure by the government to negotiate for Britain". The timing of that release angered pro-Brexit MP Jacob Rees-Mogg, who said the Treasury was trying to stop Brexit, and that it consistently painted a bleak picture "because they are frightened of taking responsibility for managing the economy without the crutch of the EU". What's in the no-deal Brexit plans? Mr Raab said reaching a deal with the EU was the "overriding priority" and "by far the most likely outcome" but that "we must be ready to consider the alternative". He also dismissed what he said were "wilder claims" about the impact of not reaching a deal, including that it could spark a "sandwich famine" in the UK. "Let me assure you that, contrary to one of the wilder claims, you will still be able to enjoy a BLT after Brexit, and there are no plans to deploy the Army to maintain food supplies," he said. With several sticking points remaining in negotiations, there has increasingly been talk of what happens if there is no agreement in place, including police chiefs warning of a risk to the public if the UK loses access to EU-wide crime databases and Bank of England governor Mark Carney saying no deal would be "highly undesirable". Pro-Brexit campaigners have described the warnings as "Project Fear" - saying the UK has nothing to fear from leaving without a trade deal and falling back on World Trade Organization rules. Conservative MP Jacob Rees-Mogg told the Today programme on BBC Radio 4 that such an arrangement "would suffice" and said the risks had been "absurdly overstated". His fellow Brexiteer John Redwood said stockpiling six weeks worth of medical supplies was "a bit over the top" but that the government was being "ultra cautious". This didn't seem a comfortable moment for Dominic Raab. The Brexit secretary campaigned for Leave, and is a true believer in the cause. Yet here he was, setting out plans to cope with a British failure to reach the kind of deal Brexiteers once claimed would be easy to accomplish. Again and again, the Brexit department's guidance refers to the "unlikely event" of Brexit without an EU deal - but Dominic Raab conceded it could happen. The risk was real. The International Trade Secretary, Liam Fox, has suggested that outcome is more likely than not. The Brexit secretary may disagree on the level of risk, but could not deny that it would lead to higher costs and a fresh burden of red tape on businesses, scientific and medical research and individuals. The European Commission said Brexit would lead to disruption "with a deal or without a deal". "That's why everybody, and in particular economic operators, need to be prepared," it said. The commission has already published its own assessment of no deal, saying there would be "no specific arrangement" for EU citizens living in the UK or for UK citizens in the EU and warning of "significant delays" at borders. 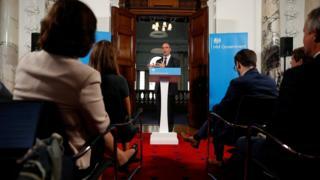 For Labour, shadow Brexit secretary Keir Starmer said Mr Raab's speech was "thin on detail, thin on substance and provided no answers to how ministers intend to mitigate the serious consequences of leaving the EU without an agreement". "A no-deal Brexit has never been viable and would represent a complete failure of the government's negotiating strategy," he said. Welsh First Minister Carwyn Jones said a no-deal Brexit would cause "huge disruption and serious, long-lasting economic and social damage", and Lib Dem leader Sir Vince Cable added: "This isn't project fear by critics of Brexit, this is the government itself and independent bodies pointing to the damage that will be caused." The National Farmers' Union warned of a "disastrous" cliff edge scenario for the UK food supply chain. Business group the CBI said: "These papers show that those who claim crashing out of the EU on World Trade Organisation rules is acceptable live in a world of fantasy, where facts are not allowed to challenge ideology." Pointing to the possibility of new credit card charges, Lord Adonis of the People's Vote campaign, said: "Every time a new Brexit paper is published, more people are made worse off". TUC general secretary Frances O'Grady said the reports confirmed no-deal Brexit was not a credible option, as it would be "devastating for working people".